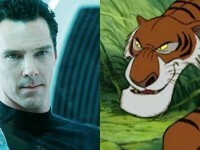 After playing the Star Trek villain Khan (Star Trek Into Darkness) Benedict brings another villain to life – tiger Shere Khan, Mowgli’s enemy in the famous children’s classic “The Jungle Book” by Rudyard Kipling. With his distinctive voice in this new film adaptation by Warner Bros. Studios he will be up to some mischief. For the first time, Andy Serkis will direct. Serkis is well known for his motion capture roles in “Lord of the Rings” and “The Hobbit” (as Gollum / Smeagol) and in the two movies “Planet of the Apes: Prevolution” (2011) and the current brand-new “Planet of the Apes: Revolution” (2014) (as Ceasar, the leader of the monkeys). At the same time, Disney Studio is also working on another remake and plans a mix of animation and live-action feature film. In this version, Idris Elba (Thor” will do the voice-over of the tiger, Oscar-winning actress Lupita Nyong’o (12 Years a Slave) and Scarlett Johansson are also discussed for voice roles.